Hydrogen peroxide is widely used to treat cuts and scrapes, but some sources warn that it doesn't reliably kill all bacteria and can even harm healing tissue. The hydrogen peroxide molecule has one more oxygen atom than a water molecule, so it acts as an oxidizer. Some bacteria can defend themselves against this, and some can't. The chemical formula is written as H2O2, and the structural formula is H-O-O-H. For home use, it's sold as a 3-percent solution in water. 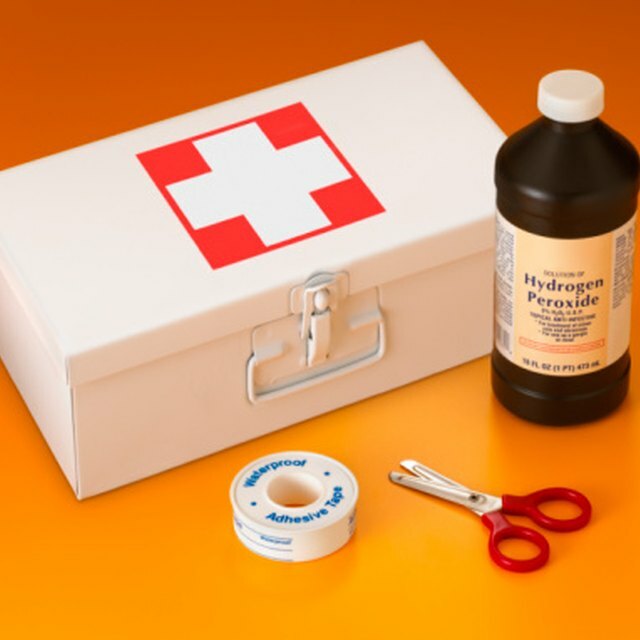 Hydrogen peroxide cleans wounds by moistening and loosening dried blood and any dirt or grit in the wound. It also helps the removal of dead tissue, which is called debridement. It foams on contact, and this effervescence helps to mechanically clean the wound, similar to fizzy denture cleaners. However, it can also destroy the cells called fibroblasts, which rebuild the connective tissue to heal the wound. For this reason, it is not recommended for long-term use. While hydrogen peroxide isn't always effective as antibacterial agent, it is a bacteriostatic agent, meaning it inhibits reproduction of bacteria. In so doing, it can help to avert worsening of infections without actually killing all of the bacteria. It can also kill fungal spores, making it a sporicide, and helps to prevent fungal infections. For these reasons, it's also used to disinfect surfaces such as cutting boards and counter tops. Oral streptococci, also known as "strep," lack the enzyme catalase, and hydrogen peroxide is effective against them at a 1.7-percent solution – so a 3-percent solution from the bottle is diluted by about half. Its debridement action breaks down the cell walls, but it needs about 10 minutes to take effect. It's able to penetrate into periodontal areas between teeth and gums. There, its foaming action and release of oxygen changes the environment of anaerobic bacteria, inhibiting their growth. It also has the effect of whitening teeth by bleaching. Journal of Biological Chemistry: Hydrogen peroxide causes the fatal injury to human fibroblasts exposed to oxygen radicals. PubMed: Antibacterial activity of hydrogen peroxide and the lactoperoxidase-hydrogen peroxide-thiocyanate system against oral streptococci. Silbajoris, Alex. "Does Hydrogen Peroxide Kill Bacteria?" Sciencing, https://sciencing.com/hydrogen-peroxide-kill-bacteria-4606163.html. 10 March 2018.